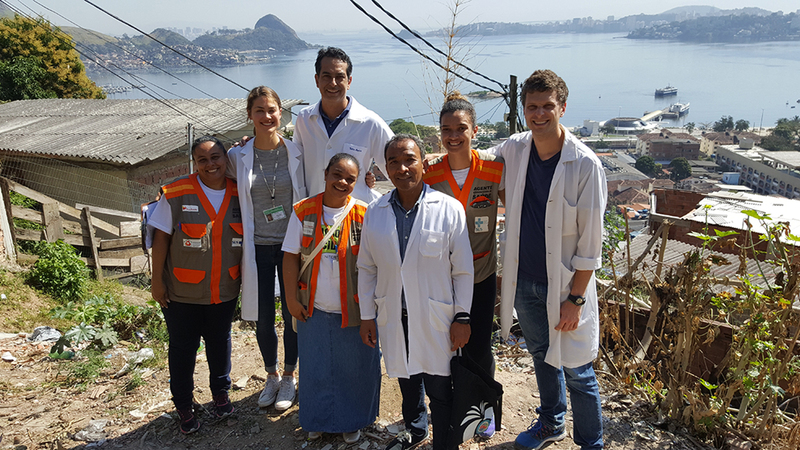 Pictured (left to right): Adriana Rodrigues da Silva (community health worker), Claire Boone, Fabio Alves (professor, UFF), Paula Valéria Costa de Oliveira Chagas (community health worker), Lee Riley, Carina Rebeque (community health worker), Robert Snyder. Photo by Gabriel Rezende. Many international travelers to the 2016 Summer Olympics in Rio De Janeiro, Brazil, openly considered skipping the games to avoid the threat of Zika. Despite the fears, not a single case of Zika or its major neurological complication, microcephaly, was reported by foreign visitors. The near-paranoia — and the diversion of scarce resources to protect a low-risk population — could have been avoided by heeding the lessons of previous epidemics, argues a new study from public health researchers at UC Berkeley. The researchers analyzed the burden of diseases that are similar to Zika and found that seasonal patterns in their spread foreshadowed Zika’s decline leading up to the games. As Zika tapered, and news coverage of the epidemic became less frequent, the truly vulnerable people became invisible, according to the study. Both during the games and today, mothers living in Rio’s sprawling urban slums give birth weekly to microcephalic babies — children born with abnormally small heads and a range of other complications. The study was published last week in the journal PLOS Neglected Tropical Diseases. The research was a collaboration with their colleagues Claudete Araújo Cardoso, Fabio Aguiar-Alves and Felipe Neves at the Universidade Federal Fluminense in Brazil. Except for sporadic reports, Zika is a disease of the urban poor. Slum-defining characteristics such as poor water and sanitation infrastructure, crowding and poor structural quality of housing offer ample opportunities for mosquitoes to breed and spread the Zika virus. The species of mosquito that most commonly transmits Zika will, on average, travel a mere 100 meters in its lifetime. In the densely populated slums of Brazil, a single 100-square-meter space could contain more than 100 housing structures, up to three stories high, with a resident population upwards of 1,000. These residents can be infected multiple times by mosquitoes circulating in such neighborhoods. To illustrate how Zika fears were misplaced, and to offer one example for how the public-health community can use data to better understand future epidemics, the study compared other mosquito-borne diseases carried by the same mosquito that carries Zika, such as dengue virus. The study showed that peak incidence of these diseases in Brazil occurred during the hottest and wettest months. Because August is a winter month in the Southern Hemisphere, incidence of the diseases plummeted around this time. Even the Brazilian Ministry of Health’s most recent Epidemiologic Bulletin reported no new cases in Rio de Janeiro between early August and September. Taken together, these data suggest that Zika infections would have tapered off well before the Olympics, which is just what happened.